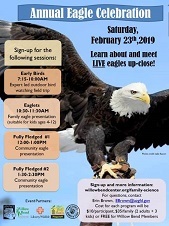 To learn more about these amazing birds, and to see live eagles, the public is invited to attend the annual Bald Eagle Celebration on Saturday, Feb. 23, at the Arizona Game and Fish Department’s Flagstaff regional office at 3500 S Lake Mary Road. The cost is $10 per participant for each program or $35 per family (2 adults + 3 kids), or free for Willow Bend Members. Cash will be collected at the door. 7:15-10:30 a.m. – “Early Bird” Eagle Walk with AZGFD wildlife biologists. Search for bald eagles and local waterfowl around Lake Mary. Pre-registration is requested; sign up for the Early Bird Eagle Walk at https://www.register-ed.com/events/view/136653. 10-11 a.m. – “Eaglets” Family Presentation. Family-focused interactive program, perfect for kids ages 4-12. Learn about and view LIVE eagles! Pre-registration is requested; sign up for the Eaglets Family Presentation at https://www.register-ed.com/events/view/136656. 12 noon-1 p.m. – “First Flight” Presentation 1. Let an AZGFD biologist introduce you to a bald eagle and teach you about these amazing birds. The presentation is open to all ages. Please note this is the same presentation as the 1:30 p.m. session. Please only sign up for one presentation. Pre-registration is requested; sign up for the First Flight Presentation 1 at https://www.register-ed.com/events/view/136660. 1:30-2:30 p.m. – “First Flight” Presentation 2. Let an AZGFD biologist introduce you to a bald eagle and teach you about these amazing birds. Please note this is the same presentation as the noon session. Please only sign up for one presentation. Pre-registration is requested; sign up for the First Flight Presentation 2 at https://www.register-ed.com/events/view/136662. For more information or questions, please contact Wildlife Manager Erin Brown at EBrown@azgfd.gov.